We’ve been in Tucson for just under two weeks and we are continuing to cross items off of our to do list. Burrito at Nicos. Check. See Coco. Check. Sleepover at Graces for Averi. Check. Eat popcorn at Roadhouse Cinema. Check. Have a couple of girls nights. Check and check. And yesterday we got to do one of the best items on the list – our annual Fourth of July pool party with the Mamafia. This tradition started in the summer of 2010, when one of my friends – who is a photographer – wanted to take pictures of the kids dressed in red, white and blue for the holiday. The pictures turned out seriously cute, so we wanted to do again the following year, and then we’ve done it every year since then. This is this years picture. Are they not adorable? Then in the summer of 2012 we decided to have a “welcome to school party” to get all the kids excited about starting preschool. All the kids brought their backpacks and each mom gave them something for school – erasers, name tags for the bags, pencil boxes, etc. We also took pictures of them where they say what they want to be when they grow up (so far Averi has wanted to be a mom, a soccer player and something else that I can’t remember). 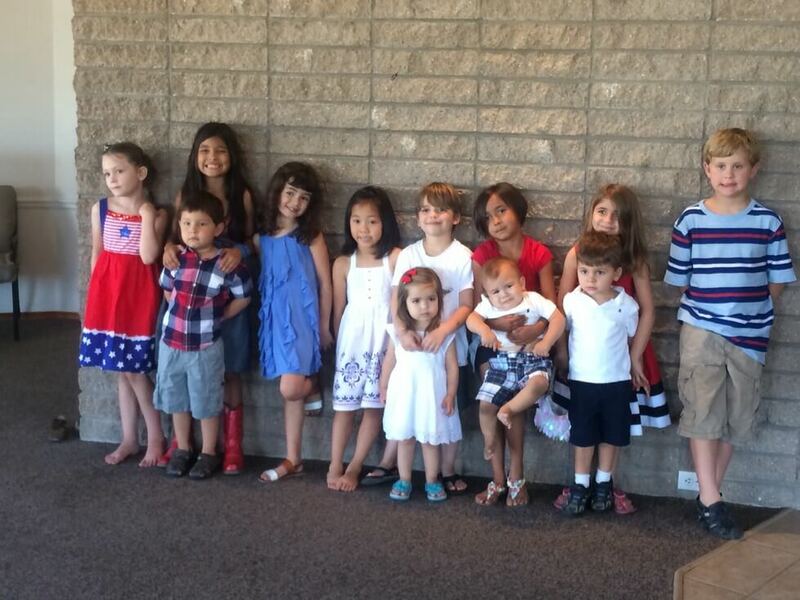 The kids loved the party. And we, of course, love any excuse to have a party, so we decided to make the back to school party an annual thing too. But by the next summer our group had enlarged to around 15 families and it was impossible to find one day that worked for the entire group, let alone two. So we merged the two traditions to create, one big can’t be missed (although some of the moms are losers and do miss it) party. This year the lovely ladies of the Mamafia were kind enough to throw the party early, so Averi and I could attend. We held it yesterday at one of our friends community pool, and we got the rec room so we could bring food for a potluck lunch. Place shredded chicken into a bowl. Add juice from limes and the cilantro. Stir to combine. Mash 1 1/2 avocados into to the chicken mixture, coating all the chicken. This will provide creaminess and binding to the chicken mixture. 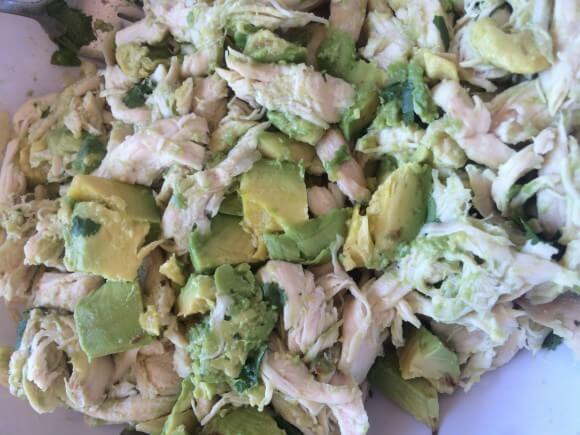 Cut remaining 1 1/2 avocado into bite size pieces, and add to the chicken. Serve in pita, tortilla, on own, or any other way floats your boat.